The celebratory customs associated in various countries with Christmas have a mix of pre-Christian, Christian and secular themes and origins. Popular modern customs of the holiday include gift giving, completing an Advent calendar, Christmas music and caroling, an exchange of Christmas cards, church services, a special meal, and the display of various Christmas decorations, including Christmas trees, Christmas lights, nativity scenes, garlands, wreaths, mistletoe, and holly. The economic impact of Christmas is a factor that has grown steadily over the past few centuries in many regions of the world turning it into an overly commercialised ‘religious’ holiday. 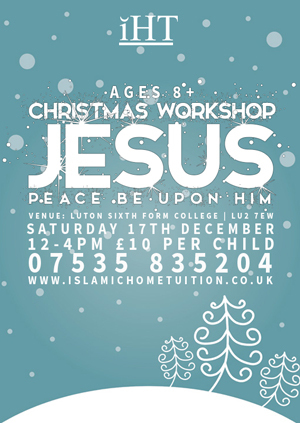 The purpose of this workshop is to educate our children on the Islamic narrative of Prophet Jesus (a), the origins of Christmas and its relevance to Muslims and the misconceptions held by Muslims surrounding it.